The APC Mini pinpoints the structuralist, somebody who's more about launching lots of clips with minimal extra control. Ideal for those who need to launch lots of clips. Familiar Live controller setup. Decent build and the price represents excellent value for money. Doesn't include Twist synth in software bundle. The APC Mini feels like Akai's effort to create a Launchpad with faders. That basically sums it up, and it's the closest thing on the market to that concept. 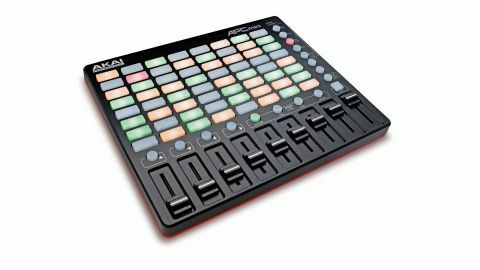 The Mini has more clip launch buttons than any other Akai device, with 64 of them, in an 8x8 grid. This puts it on a par with the Launchpad and Push in terms of clip launching fire power. "Use of the Mini will be more fluid if you keep it to the basic top-level functions"
The pads are so small, they're more like little rubber buttons. Of course they're too small to offer velocity response, and the colours are limited to amber, green, and red. You'll be familiar with this if you've used any other Live controller: amber = clip present, green = clip playing, red = recording. Not a very sophisticated set-up compared to Push, but effective enough. Below each row of eight buttons is a fader, and there's also a ninth, master track, fader at the right. It looks straightforward enough, but there are other functions available through use of the Shift button in conjunction with the circular buttons that run below and to the right of the clip launching grid. By default, these function as track stops (bottom row), and scene launch (right row). By combining with the Shift button, they can also be used for track/ scene navigation, solo/arm/mute, stop all clips, and to assign volume, pan, send, or device, control to the faders. We can imagine that use of the Mini will be more fluid if you keep it to the basic top-level functions - unless they're motorised, multi-function track faders are not fun in a live situation. Be aware, the Mini doesn't include the Twist synth in the software bundle. The price and build are right, and critically, the control layout makes sense - there's no head-scratching and pondering why they did it like they did. It's very focused on Ableton Live, which is what it claimed from the outset.